Real Wagon Wheels, Real Wood Wagon Wheels, Real Wagon Wheels Handmade, Handmade In The USA. Real Wagon Wheels, Real Wood Wagon Wheels, Real Wagon Wheels Handmade, Handmade in the USA. 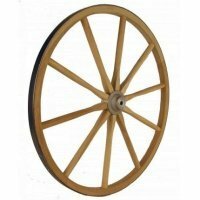 We also make Wagon Wheel Chandeliers, Cannon Wheels, Horse Draw Wagon Wheels and Wagons. Wood Butter Churns, Wood Buckets. Yesterdays Handmade Real Wagon Wheels, Handmade Today in the USA. We are a family owned and operated business located in the Appalachian Mountains of Eastern Kentucky and Eastern Pennsylvania. We have been making Custom Wagon Wheels, Wagons, Wood Buckets and Wood Butter Churns for 50 years. All of our products are handcrafted from quality wood. You will find our wagons, wagon wheels, and wagon wheel chandeliers in the movies, on the beach at resorts, in university theater groups, theme parks, at work in Central Park, on working wagons everywhere, our wagon wheels are even on Broadway in theaters. Below are some of the products you will find at our online store, click on an item for more information. Visit our online store to view our complete line of products. To visit our store, Click Here! We can custom build any size or type of axle to custom fit your wheels and your project. No matter what size wheel or axle you need for your project, we can make your axles for you. Our metal axles are made from solid square solid steel stock, machined on each end to match the wheel, the ends are threaded and shipped with nuts for the ends. For Axle Pricing, Please Contact Us..
We are a family owned and operated business, located in the Appalachian Mountains of Eastern Kentucky and Eastern Pennsylvania. You will find our Custom Wagon Wheel In the movies (Paramount, DreamWorks, Warner Brothers Pictures, Disney, Turner Films), on TV (Trading Places, Into The West, Myth Busters), on the beach at resorts, in university theater groups and major theme parks (Disney, Six Flags, Silver Dollar City, Kennywood, Tweetsie Rail Road) across America. Click Image To View Wood Wagon Wheel Information And Larger Image. Click Image To View Wood Wood Wheel Information And Larger Image. 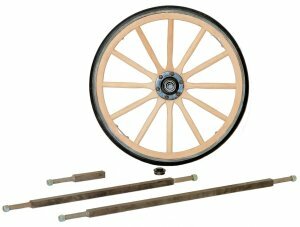 Click Image To View Wood Carriage Wheel nformation And Larger Image. Click Image To View Wood Carriage Wheel Information And Larger Image. Click Image To View Cannon Wheel Larger Image And More Information.